Shiloh Krupar’s Hot Spotter’s Report is an experiment. She pushes geography beyond the confines of social scientific inquiry and into terrains of art practice and performance where questions of research process and cultural production are much more expansive. Moreover, she draws on political rhetorics of satire, camp, and irony to diagnose and speak back to absurd realities of nuclear ecologies and governance. Her work makes important contributions to understandings of spectacle, the production of nature-human relationships, and the intimate labor and health politics of nuclear production. Not least, this project is committed to theorizing and developing practices for recognizing and opposing state technologies of erasure, forgetting, and violence. This book review symposium gathers essays from three distinct vantage points: Ryan Griffis, a theorist and artist in art practice; Julie Sze, a theorist and practitioner of environmental justice; and Cindi Katz, a feminist geographer. This scope of critical commentary speaks to the range of intellectual, aesthetic, and political domains that Shiloh Krupar’s work spans. This forum grew out of a vibrant “Author Meets Critics” session that I organized for the Association of American Geographers meeting in Tampa, 2014. I thank the contributors to the AAG session and to this forum for their critical contributions. In my opening essay, I reflect on the personal stake that I have in the project (there’s a pdf available here) before offering a brief overview of the approach, content, and signal contributions of Hot Spotter’s Report. Next, each of the contributors gathered here brings a unique disciplinary perspective and focus to a particular dimension of Krupar’s work: Julie Sze situates Hot Spotter’s Report within the context of American Studies and environmental humanities; Ryan Griffis takes up the question of documentary narrative and naturalism; and Cindi Katz reflects on irreverence and its methodological and formal imperative in politics and radical geography. Closing out the forum, Shiloh Krupar describes how she has put hot spotting to work in her own home as a modest (and wildly creative and historical) practice of demilitarization. At the most immediate level, Hot Spotter’s Report helps me understand where and how I grew up. I went to high school north of Rocky Flats in Boulder and commuted to school in a few little cars in my years there. My friends and I would sometimes drive the road that hugs the Front Range from Boulder, by Rocky Flats, through Golden to get to Denver, where we’d go to an all-night coffee shop named Muddy’s (sadly closed), or to some all-ages dance party (uniformly terrible). On particularly windy days on this road, my little car would be buffeted about and semi-truck trailers would be toppled over. I didn’t really mind the windiness of those days, but I took notice because of an article I had read about Rocky Flats–by then decommissioned–probably in the independent weekly, Westword. By then Rocky Flats already looked like the empty plains that Shiloh describes, but that emptiness was a scandal–a ridiculous, dangerous, and invisible scandal. As I recall it, investigators had found a shack on the property where the nuclear detonator tips were manufactured. This tiny building, seemingly improbably, had not been remediated. The article reported that the building apparently was not designed to withstand the same strong winds that would wrench the car doors out of our hands when we’d park to go to class. Its small size minimized its importance, but its frailty amplified its threat. The architectural shoddiness seemed like a ridiculous oversight then and still was a few years later at my college work-study job in California. I administered research grants, and one professor had won a small contract to use GIS to determine whether the property values of homes neighboring Rocky Flats had been diminished. I wondered who could have thought to buy a home there, but then, of course, there was a great view and proximity to trails. I was a kid who grew up with the Cold War firmly placed in Colorado. After all, Matthew Broderick was a cute teen star of WarGames (1983) whose character hacks into the US military’s computer at NORAD outside Colorado Springs, almost setting off World War III. (My guess is that my family is not the only one that tried to visit Cheyenne Mountain after the movie was released.) And then there was Red Dawn (1984), a Cold War Brat Pack flick with the likes of Charlie Sheen, Patrick Swayze, and Jennifer Grey (vindictive big sister of Ferris Bueller, and Grey and Swayze would later star together in Dirty Dancing). In this plot, high school students defend their remote mountain town of Calumet, Colorado from a Soviet invasion, which was backed by Cubans and Nicaraguans. And Colorado was also the location of apocalypse, a scenario befitting the Cold War. In Stephen King’s The Stand, the few humans who survive a devastating plague try to make their way to the “Free Zone” in Boulder. Not surprisingly, these popular texts did not enable me to understand or even recognize the contradictory military-industrial complex landscape in which I actually lived. To audiences outside of Colorado, these films weren’t so much about the state as about the middle of the country, places within nationalist imaginaries that should be the most invulnerable to external threats. Violence was rendered outside of this place, and certainly not situated along the I-25 corridor of active and decommissioned military bases, the Air Force Academy, and “defense” industry operations stretching south into New Mexico and the nuclear colonial landscape of Los Alamos and White Sands. These films operated as a form of spectacle, which Krupar explains “functions as an architecture of separation–an arrangement of division–between humans and nature, humans and waste that resuscitates ideas about purity positioned against contamination” (p.9). And so we have youthful, hetero protagonists who assume adulthood through contending with Cold War threats. They would help to separate nuclear toxicity and war production away from the actual militarized places–at Rocky Flats and the Rocky Mountain Arsenal, etc, etc.–in which we live. When toxicity did erupt, as with windswept Rocky Flats, such films could help to relegate contamination to a past, external conflict and to bad apple contractors, rather than create the conditions for contending with the US as a nation that “lives in and as residues of war” (p.3). In short, Hot Spotter’s Report provides those of us who grew up in places where nature simultaneously is revered, destroyed, and violently redeemed with tools for recognizing state violence in all its forms and for stepping into a different approach to politics. This includes efforts to explore and disrupt practices of settler colonial erasure and militarism. 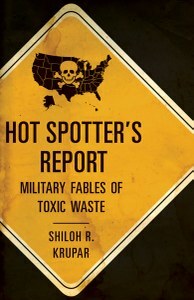 Considering the absurd bureaucratic rationalities and deliberate obfuscations that characterize the US nuclear defense complex, Krupar’s turn to formal experimentation through the use of satire and creative nonfiction aims to “show the tremendous labor spent erasing signs of labor, the logics of efficiency at work, and the cleanup operations of ‘legacy management’” (p.97). In Chapter 1, “Where Eagles Dare”, Krupar commissions a study into the transformation of the Rocky Mountain Arsenal from a Superfund site into a National Wildlife Refuge. The EAGLE Collective, a “garbage landscape engineering firm” (p.32), secures the subcontract to conduct the report, and “digs around the refuge to report on purity and origin stories” in order to “uncover the ambiguity between habitat preservation and the sanitizing of historic extermination at the Arsenal” (p.32). The collective unearths real estate conversions, echoing the property value concerns I’d witnessed as a student worker, which rely on deploying the conservation and amenities of the “great outdoors” (p.70). Chapter 2, “Alien Still Life”, scripts a PowerPoint presentation to perform these logics and bureaucratic maneuvers in their own absurd terms. She illustrates how the Office of Legacy Management, an actual Department of Energy agency, functions to efficiently erase ongoing toxicity and sustain unaccountability, further analyzing these power plays through mimicking governmental auditing mechanisms with her own Endgame of Government Oversight report. One endgame is the systematic denial of nuclear workers’ compensation claims, the subject of Chapter 3, “Hole in the Head Gang”. Here, Krupar shifts scale to examine the “remaindering” of former defense workers through legislation intended to provide “recognition and recompensation”(p.160, 164). A close reading of procedures for compensating defense workers denounces how uncertainty and the unknown or “‘holes’ in data serve as epistemic objects of rule that can render workers immaterial…Calculations of ‘uncertainty’ about exposure and dose obscure and depoliticize the materially linked but differentially inhabited risks that remain from the domestic production of nuclear weapons and geographies of the Cold War” (p.171-172). Whereas the legislation advanced a rhetoric of “restoring wholeness”, Krupar draws out an “ethics of living as the remains–as inassimilable remainders–[that] works with the residues of state operations, the holes of knowledge and uncertainties, to politically agitate around making new kinds of communities via disease clusters, networks of document watching, the sharing of occupational memories and bodies of evidence” (p.212). It is this question of “living on” that animates Chapter 4, “Transnatural Revue”, and the conclusion where Krupar proposes a transnatural ethics, which she defines as a “tactical, relational ethics” that questions the commonsense divide between nature and military through centering the category and process of waste. For Krupar, such an ethics is not innocent or uncompromised, but dangerous: “there is no pure or safe position of critique; the response is generated in the action, with tools that are ‘contaminated’” (p.225). The objective, she explains, is to “reveal the material work that produces the separation of nature as pure and to attend to the remainders of this separation, such as subjugated knowledges, ‘impure’ cancerous bodies, perforated land, and abject materials, such as nuclear waste” (p.227). Creating counterspectacles “forward aesthetic practices that seek a more just politics by envisioning rearrangements of which ecologies, communities, or entities can enter politics” (p.220). As such, she turns to the interventions by the queer drag queen Nuclia Waste–who makes her home at Rocky Flats and uses camp to explore mutancy as unruliness, rather than cause for normalization or purity–and the nuclear sculptor James Acord, who sought to transmutate the waste of nuclear weapons into art objects. Living on and transnatural ethics also animates other work that Shiloh has done independently and in collaboration with Nadine Ehlers on the biopolitics of cancer (Ehlers and Krupar 2012, 2015; Krupar and Ehlers 2015), with Greig Crysler on the political and aesthetic economy of waste (Crysler and Krupar 2015), and with Sarah Kanouse to establish a government agency dedicated to reckoning with ongoing nuclear and military presents in the landscape (http://www.nationaltlcservice.us/). In closing, I want to offer a short reflection on how Shiloh’s work might be brought into other struggles around environmental and social devastation. Not long ago, I had the good fortune to see a screening of Goodbye Gauley Mountain: An Ecosexual Love Story (http://goodbyegauleymountain.org/). In the film, Beth Stephens and her partner Annie Sprinkle explore and speak to the residents of the coal mining country of West Virginia where Stephens grew up. The couple, who live in Santa Cruz, had been organizing performance art weddings to the Earth, after which, Stephens writes “we found ourselves falling more deeply in love with our planet each day, and our romantic connections began to grow and grow. We began to experiment with the metaphorical shift from Earth as mother, to Earth as lover”. They began to inform their performances with what they call an ethics of ecosexuality; if we treated earth with the care and pleasure with which we treat and experience our lovers, then more people may be motivated to direct political action. The wedding they perform to Gauley Mountain is flowy, flamboyant, and glittery, and features local musicians, creating an oppositional cultural gathering shared by area residents and activists. The playfulness of their ecosexual environmentalism invites people to embrace and politicize their sensual experiences with the natural world and to join in enduring, mutual human-non-human relationships. While watching the film, I found myself falling in love with the creativity and adoration animating their project. Certainly part of the appeal of ecosexuality is its critique of the patriarchal Western construction of Mother Earth as dominated and violated. Yet, the film’s innocent posture also sidesteps the problem of cruel, inattentive, or fickle lovers, or even falling out of love. So, I wonder how this project might be conceived differently through a transnatural ethics. Rather than marrying nature, as what is left or what is still pure, what if an ecosexual ethics embraced the waste of the mountain tops that have already been removed, the communities and labor struggles that have been wasted, the prisons being built atop these toxic sites, and the people caged within (Schept 2014)? What other communities might be brought together in loving places and people that have been remaindered, but are clearly carrying on? Hot Spotter’s Report can help us imagine and act on these questions for living on amidst and against the violent abandonment of security spectacles. 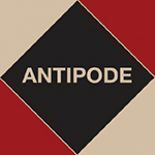 This entry was posted on 29 September 2015 by Antipode Editorial Office in Reviews and tagged art, biopolitics, camp, cold war, compensation, environmental history, environmental justice, ethics, fiction, health, irony, irreverence, military, military-industrial complex, nature and society, nuclear cultures, nuclear ecologies, performance, satire, social science method, spectacle, suburbs, the body, the state, war, waste.